Potatoes boiled and diced – 2-4 nos. Green chillies finely chopped – 2-4 nos. make a stiff dough and let it rest for 15 to 20 mins. · Heat some oil in the pan,add the cumin seeds,ginger garlic paste,green chillies. and turmeric mix well and let cook for few mins. · Then add the red chillie pwdrcoriander pwdr and cumin pwdr.add little water so the masalas don't burn. 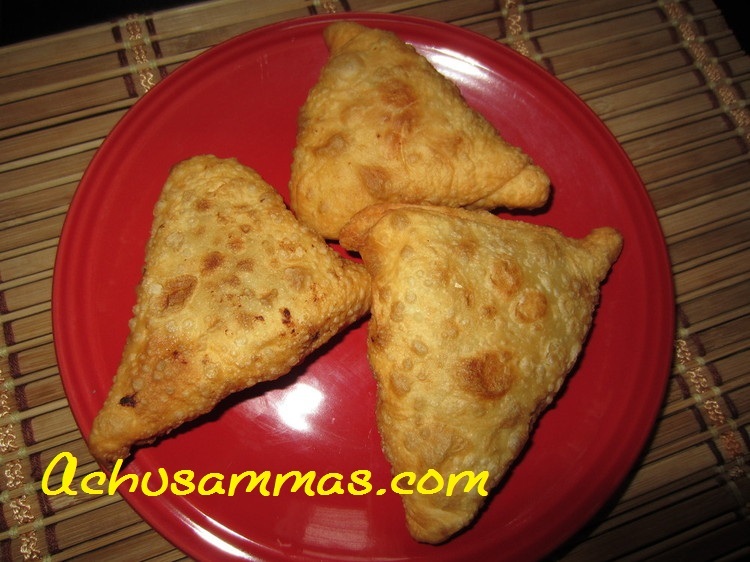 · then add the diced potates,salt and coriander leaves.sprinkle the lime juice over it. you can make any stuffing of ur choice with any variations. · Make rolls of the dough depending on the size of samsosa you want. roll the dough in circle first and then make them oval in shape. · Fill the cone with the stuffing and seal the edges like to get a triangular shape for the samosa. 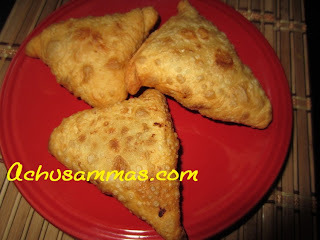 · Now fry the samosaos in the oil till they turn golden brown. Enjoy the samosas with ketchup or chutney.